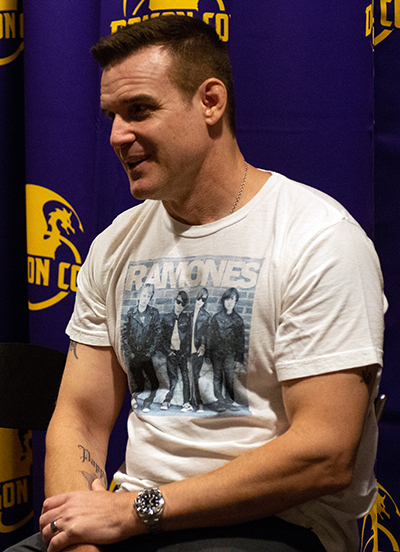 Dragon Con is back in full swing, and that means it’s time to catch up with con favorite Eddie McClintock. At a press conference on Friday, he talked about his villainous ways, what he’s looking forward to seeing at Dragon Con, and his warehouse artifact of choice. Don’t be alarmed. If you find yourself liking McClintock’s villains, it’s by his own nefarious design. When he played Jack Payne on Shooter, he tried to make Jack’s personality as much like Warehouse 13’s Pete Lattimer as possible. “When I was playing Jack Payne, I tried to make him as likeable and light as possible even when he was doing terrible things. … Crazy people don’t know they’re crazy. They just are. I find that more interesting. It wasn’t difficult to play,” McClintock stated. Once again, don’t be alarmed by these two words that seemingly would never go together: creepy and McClintock. But they do now. In McClintock’s upcoming movie, My Stepfather’s Secret, let’s just say there’s some massively creepster leering going on of a young girl. For that reason, the movie is on a can’t-miss list because it’s hard to picture. After all these years, what does McClintock look forward to most at Dragon Con? The pant-less chaps, insane fandoms, fantastic cosplays, catching up with former cast members, and being able to talk about Warehouse 13 because he isn’t able to very often. One thing that fans eagerly anticipate is the annual T-shirt reveal. This year’s McClintock original is a throwback to an earlier version with the iconic football that he thinks was the most popular design and the addition of the Spine of Saracen from the “Burnout” episode on the back. In that episode, you really saw Pete’s commitment to the warehouse, and this year’s shirts are a nod to the fans for their commitment and support for the show long after it’s been off the air. The shirts began as a gift to the crew when the show wrapped the series finale and a thank you to them for their commitment. Then, his wife suggested that he make them to take to cons for his fans to enjoy. McClintock debuted his first shirt at Dragon Con seven years ago, and it’s become a tradition. So what artifact would McClintock like to find and use? A John Holmes anatomy-enlarging pump. What he would really like to possess is Janis Joplin’s backstage pass from Woodstock. It’d give the wearer the ability to attend any concert from any era, but it would come at a steep price. The user would become a terrible alcoholic and end up in rehab. With Lindsey Lohan. If you follow the Daily Dragon (maybe just me) + Eddie McClintock ship, then you know that one role he’s always wanted to rip out is being in a movie all about poop. “I think it’s underrated, and frankly, it stinks.” So far, he hasn’t found anyone else to take the plunge.